This art deserves respect, attention and silence. That’s the reason we do not serve meals. The din of a restaurant interferes with the creative silence that flamenco artists need, apart from undermining the greatness of this art. 100 years ago, we danced and sang in basements of vaulted bricks, like ours. Artists on a small stage, surrounded by fans. The private party intimacy, family, impregnates the genes of this art: it is the essence of flamenco. Flamenco is a song to sing in the ear, a secret of the soul that confesses to a group of people nearby. That’s why we do not need, or use, microphones and speakers. The sound comes clean, authentic, from instruments without amplification. Our artistic director, “El Mistela”, National Prize of the Flamenco Critic, has formed around him a group of flamenco stars. A small family, united especially, by the high artistic quality of its members. and the complicity between artists, is what sets us apart, and it’s what we offer every day in Essential Flamenco. My family and I loved it, it was the highlight of my trip!! I loved it! I vacationed in Madrid from USA & this was by far the highlight of trip. The dancers & musicians are incredible and talented. The music was intense and the audience was brought along with the dynamics changes and musical shifts in moods. The atmosphere was cozy and intimate, I'm still buzzing a week later over how unique and exciting this was. This is a must-see! We enjoyed this performance very much . 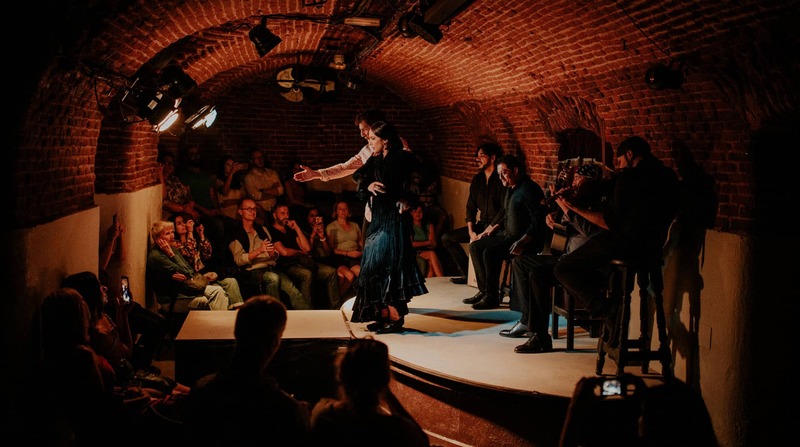 We came to Madrid for vacation and wanted to see an authentic flamenco show, not the ones specially prepared for tourists that look like a broadway show, this is the real flamenco , the venue is an old arched room , the dancers are so close to you that give you the intimate feeling of having them at own house. Guitars and violins sound beautiful and the flamenco couple perform superb. No frills, no dinner or tapas, just serious music and dance along with a glass of sangria. Totally recommended. This is the fourth time I’ve been to watch the Essential Flamenco show at El Torero, and I don´t know how, but it just gets better each time. The passion, rythym and great sense of enjoyment from the musicians and dancers, captivate the small audience in this intimate and authentic surroundings. The dancer and his highly talented group of artists, remind you what is so special about flamenco. One can not come to Madrid without seeing this show. This show far exceeded our expectations. We were simply blown away by the power, the passion and the artistry of the performers. The young singer was a joy to watch, and the dancers were stunning! Being in such a small space made it even more special, as you can feel the drumming in your chest and the pounding of the feet on the stage. We loved every minute of this and would highly recommend it to anyone wanting to see authentic flamenco!